I love using fresh herbs, spices, fruits and vegetables to create signature craft cocktails that are not only beautiful but delicious as well! If you’re looking for a complete experiential bar package, we can serve any of our beverage packages from our mobile bar! We also rent out our bar without bar services for events that do not need bartenders. plastic ware that looks like glass with crystal-like clarity, recyclable and shatter-proof. 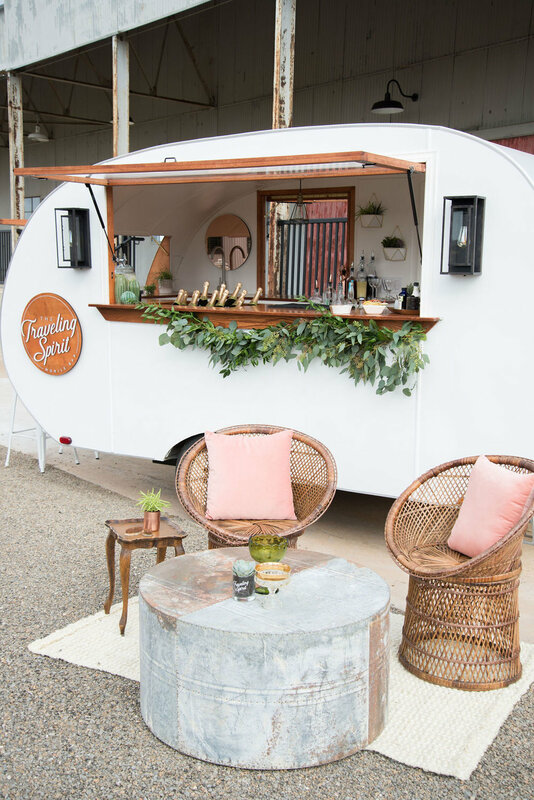 Our camper bar looks so cute all dolled up! fresh floral garland and tassels look great on "Betsy". We work with Southern Stages Rental company to create that perfect "lounge" area. Due to Texas liquor laws we do not provide alcohol but we can help with ordering and delivery. We generally estimate alcohol to range from $5-$10 per head, but can give you a more detailed estimate if you contact us!